As a patient at Children’s Healthcare of Atlanta, days are filled with a lot of rules, from strict medicine schedules to countless doctor appointments. But on a recent Saturday at Hartsfield-Jackson Atlanta International Airport, there were only two rules that really mattered: 1) Keep the window shades down so we can travel at supersonic speeds, and 2) Have fun. 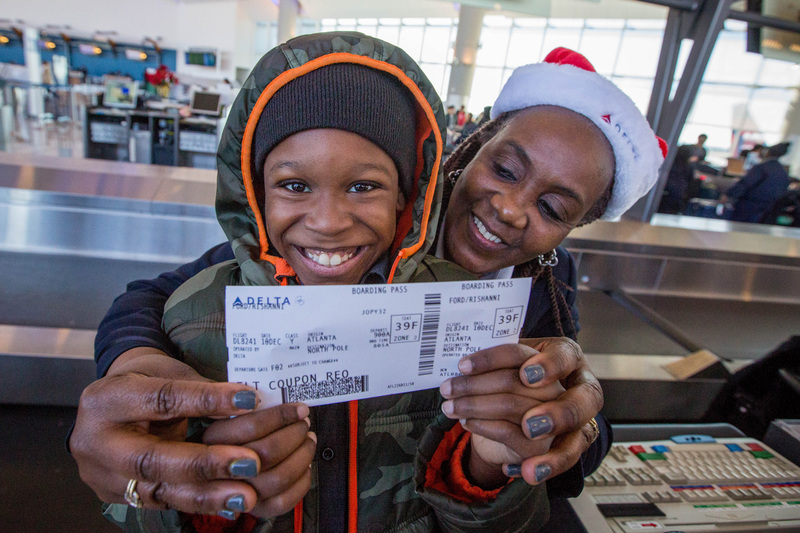 The instructions came from Chief Delta Pilot Barry Holmes, who took 38 kids ranging in age from 3 to 10, from Children’s Healthcare of Atlanta’s (CHOA) Aflac Cancer and Blood Disorders Center on a special holiday journey to the North Pole aboard a Boeing 767, an annual event now in its fifth year. And while the aircraft never actually left the ground (unbeknownst to its young passengers), the North Pole trip was symbolic of a much larger journey they are facing — one that requires courage, hope, and at times, a little magic. The chilly December day began early for the kids, who are battling a range of diagnoses, including leukemia, brain tumors, hemophilia and sickle cell disease. The trip came as a surprise to many patients who did not learn about their North Pole itinerary until that morning, though plans had been in motion for a month. Cassandra Bolding told her daughter Nylah that they were going on a “special date” and made the familiar early morning trek over to CHOA. Yet the scene that awaited them was quite different from what they are used to: Nearly 25 limos — donated by 17 different companies — lined the streets ready to transport the kids and parents over to the airport. 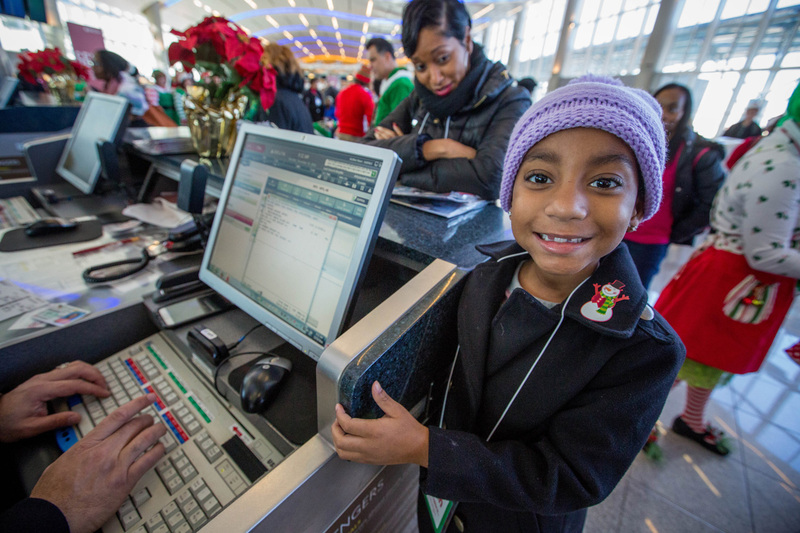 As the seemingly mile-long limo motorcade arrived, escorted by the Atlanta Police Department, a contingent of spirited elves greeted the kids curbside and helped direct them to the “North Pole” check-in counter, where they received their special boarding pass and watched the gate agents in action. As the flight-time drew closer, excitement began to build among kids and parents. Rishanni Ford (answering to his elf name “Blizzard O’Frost”) rehearsed his Christmas wish list for Santa, which included Halo 4, Batman Arkham Asylum and Yu-Gi-Oh trading cards — and that was just the start. And while the mood was light, a rare occurrence in these kids’ day-to-day life, the significance of this adventure was not lost. “Our kids are challenged in ways that are unimaginable to most in almost every aspect of their lives. 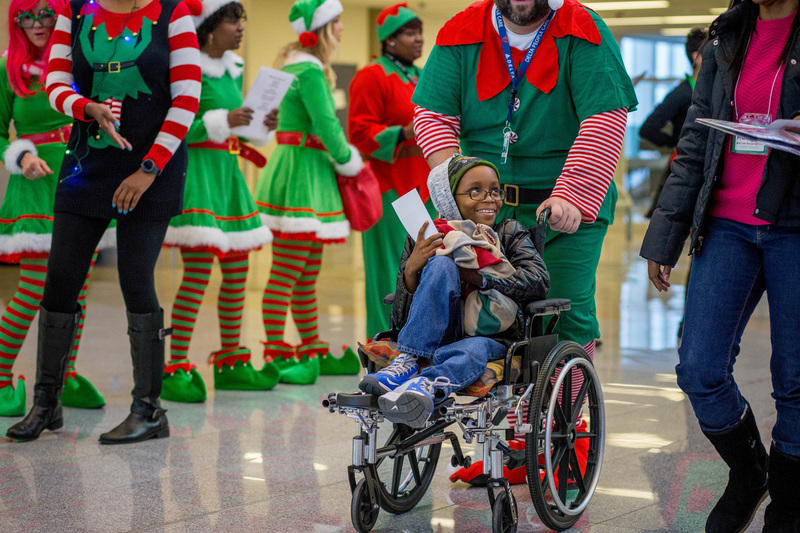 Seeing the magical, transformative power the journey to the North Pole has on their faces and souls, even for one Saturday morning, is so heart-warming,” said Megan Hafer, program coordinator at Aflac Cancer Center at CHOA. Meanwhile, a group of Delta employees, dressed head-to-toe in homemade elf costumes, continued preparing for their VIPs’ arrival, putting the final touches on the “North Pole,” a room filled with falling snow, snowballs, Santa and Mrs. Claus, a photo booth, crafts and sweet treats. “As a dad, this puts my Christmas in perspective,” Holmes added, a father of three, including a son who is training to be a pilot at Auburn University. 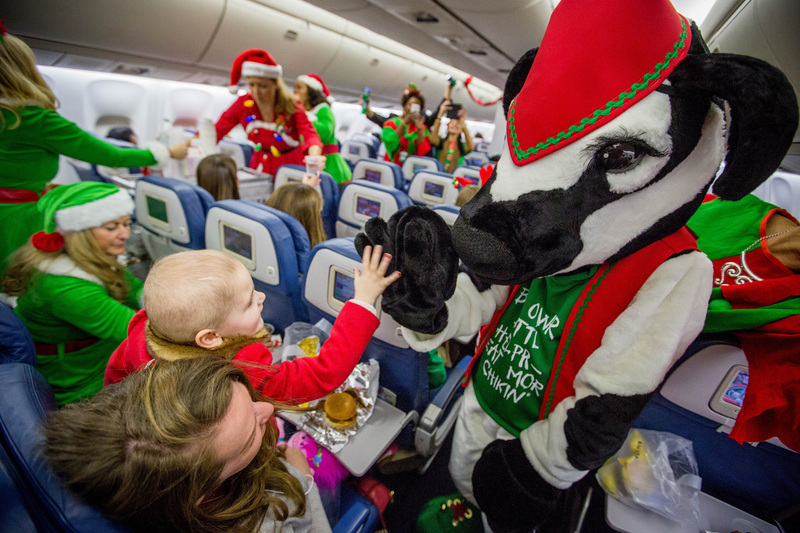 After boarding the North Pole-bound flight and while preparing for “takeoff,” Denise Gibbs, one of seven flight attendants on the flight, distributed hand-knit winter hats for each of the kids as elves snapped “elfie” photos, and Christmas carols echoed throughout the cabin. And there was only one minor problem upon landing in the North Pole: reindeer were in the way. As the cheer continued in the North Pole with snowball fights, special whisperings with Santa and gifts, one thing was clear: there was much more at play than just the energized kids. “It is an awesome experience, and makes us forget about the long three-week hospital visit,” said mom Valerie Foster. “Sometimes you say, ‘Why me?’ but it’s nice to be in the company of other people going through this. A lot of us are meeting for the first time. Days like this make us realize we have a lot to be grateful for,” Foster added.